Whether or not one chooses to interact with their peers over social media networks like Facebook or Instagram, I’ve noticed that certain pairs of friends or siblings form what seems like impenetrable cliques. Specifically, the whole purpose of joining social media sites was originally supposed to bring people closer together; in reality, it created this “either/or” dynamic. Once again I ask, “Was this technology’s fault?” It brought old friends or new colleagues together to interact, but now it’s causing a separatist dynamic. Using a variety of decorative patterns and motifs found in the history of art, I attempt to create a dialogue where each object uses a motif to symbolically reference two differing personality-types of individuals that I encounter regularly in my social networks. Note, these small-scale sculptural works do NOT refer to any specifically named individuals, but rather persevere to be more accessible, creative metaphors for this overarching behavior. Think of an overall dynamic instead of “singling” anyone out. For example, picture any two siblings (sisters or brothers) you may know. It seems that within these social media cliques one sibling is the more dominant personality and invariably controls or greatly influences the behavior – in this case, online – of whom sibling #2 feels comfortable to interact with openly on Facebook, Instagram or any new social site. In case one thinks this is only a dynamic that affects young people, students or teens, think again. We all have experienced this in our frustrating quest to consume media online. 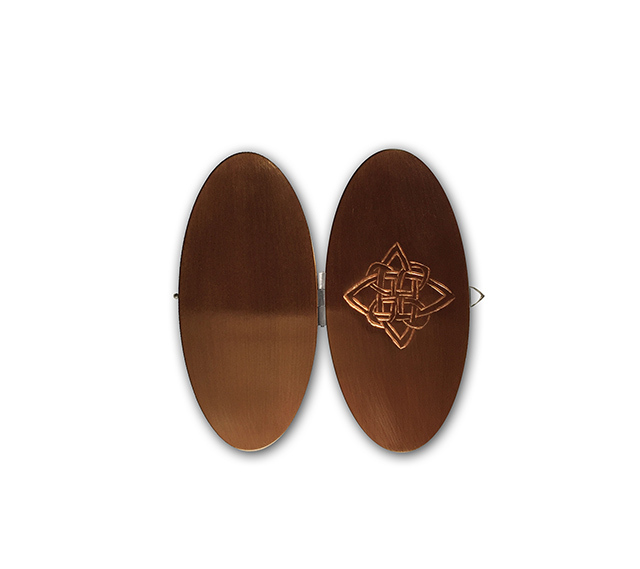 Kells Widget is a petite sculptural box, hand-fabricated in bronze – only three inches long. 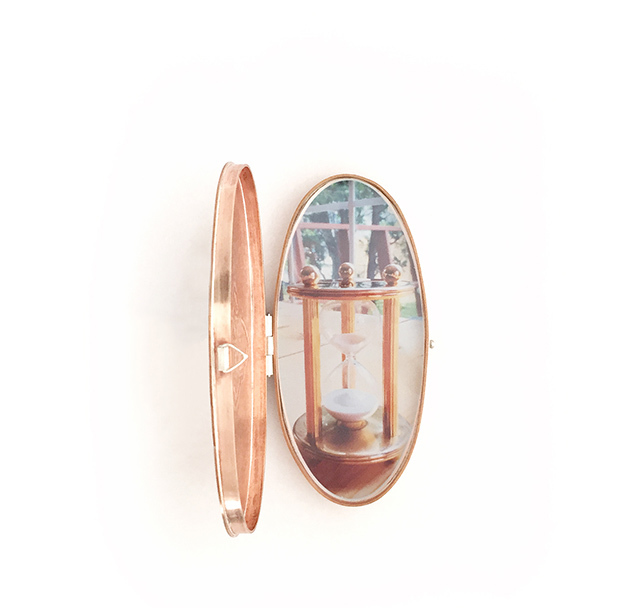 While it is in fact a modern-day take on a reliquary, I prefer to think of it more as a modern talisman. One is initially seduced by the brushed “sheen” of bronze metal with a pattern I hand-chased on its cover to resemble a decorative motif from the ancient Celtic illuminated manuscript, Book of Kells. However, upon opening the piece – one reveals to the viewer an unexpected screen snapshot of an hourglass I captured digitally then manipulated in software. The image shows each grain of sand moving at a snail’s pace, while in actuality, we are hemorrhaging time rapidly though our sometimes-obsessive and daily use of social media. I hope the contrast of this object’s historical front motif with the “Instagram-esque” interior image shows how time is really of the essence, and how we allow this technology to consume our personal lives. The goal hoped to achieve is to encourage individuals to think for themselves when interacting. At present, I have several other sculptural, mixed-media pieces in the works, in addition to my new Kells Widget. I hope to be posting another blog update soon to artdoesmatter with details of these new Widget pieces that are the basis for a new body of metalwork. Wow! that rang a lovely bell for me. I have an absolute visceral reaction to ancient Christian art and text. What a wonderful way you have honored The Book of kells and also good to see a spotlight put over social media use. Thank goodness the young people in my life somehow managed to not really get hooked in and are readers and artists and in fact 4 of them are playing a game right now. Sharon, such profound and lovely things to say. I do wish that history – and especially history of arts – were something that more mainstream folks comprehended, but they DO understand and “get” what I’m trying to say here in the tying of the two ideals together. It’s ironic that more than any previous post I’ve made, in the past few days numerous friends and family have brought up seeing this on here and understand my intentions in this work right away more than most other pieces! It’s refreshing to be able to connect in-person w/ them (but also through this blog or online if distance is an issue.) Thanks so much for sharing your thoughts w/ me today! Like gentlestitches, I found this bridging of art history and today’s world, through your Widget, quite relevant and compelling. I also like the fact that you refer to your piece as a “modern talisman” rather than a “reliquary”. In a way it is so much more positive and hopeful, suggesting that the more art we make/we interact with, the better and the happier we’ll be for it as a society. Patricia, great piece! I look forward to seeing the next pieces in the series and continuing the conversation! Dominique, I’m so happy you “stopped by” to visit and read my post! Now that I’m involved in two additional pieces that embrace this bridging of art history w/ today’s modern issues – I stop and question to myself constantly, “Why is history (of art esp.) soooo important to me? But it IS, and I can’t imagine making art objects of any sort that would hold my enthusiasm or excitement as much. As you already know, much of art made through the ages broached topics of political turmoil or were veiled “commentaries” on social issues of its time (thinking of Spanish masters like Velasquez or some of the portraiture of royals in the history of painting….) among TONS of other examples. I do hope that people who interact with my pieces can appreciate this factor in some way. And I want to add how much we NEED teachers/makers of both metalwork and art history like YOU to keep this enthusiasm going. Thanks so much for your lovely comments and sharing them w/ me today! Lovely work and I look forward to the other pieces in this series. Art history is important to you because you love the continuum of this ever evolving field. You have found a way to bridge the past into the contemporary. I wish, however, that I would encounter more younger artists who felt similarly. For some, what came before is not as relevant as it used to be. I ran into a university-trained artist the other day who had not heard of Rembrandt! Al, I’m so glad you stopped by and commented. You always seem to grasp any direction where I’m heading w/ my work. How I love your thinking around this piece! We are indeed getting trapped in something outside of our control, the need for attention on social media. And time, yes, time is an issue – how do we use it? and what do we get out of it? My day job is with an online community platform, a European niche platform around culture and society. We are a small player in the field, but we are constantly thinking about these issues, both as being in the shadow of the big platforms, and thinking about “how can we promote an online culture that gives more value for its members”? Just as much as I believe in and support online connections (both in private life and for work), your piece and your questions do hit me. We need to keep questioning our own behaviour, always. And the “separatist dynamic” is something I didn’t think of in those terms, that’s definitely an eye opener! Gunilla – your very thoughtful comments here today have so moved me. It was a pivotal piece – and pivotal moment for me. And for ALL the reasons you’ve just so eloquently spoke of in your comments above!! I feel I’ve found a true kindred soul in you – and wish to add how very cool your day job sounds to me! Your comments here have made my night. I hope your jewelry practice continues to thrive and grow; I will definitely continue to enjoy following your latest ventures! Thanks so much for dropping by and commenting!